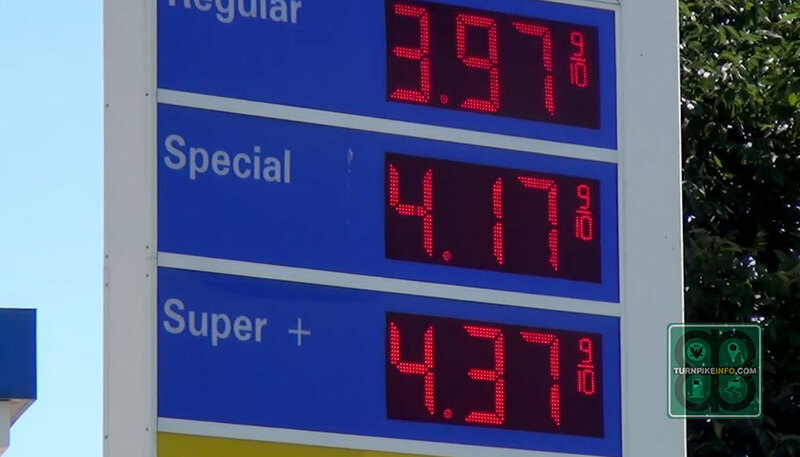 The nation’s average per-gallon gas price dropped 9-cents for the second consecutive week, according to the latest survey from the U.S. Energy Information Administration. The E.I.A. report shows the average price for a gallon of regular unleaded is now only $3.12, down 59¢ per gallon since prices peaked just before the start of summer. Based on a 15-gallon tank, the average U.S. driver is now paying almost $9.00 less per fill-up than six months ago. In some regions of the U.S., the average price for that survey district is now less than $3.00 per gallon, such as the Gulf Coast, where prices are now, officially, averaging about $2.91 per gallon. 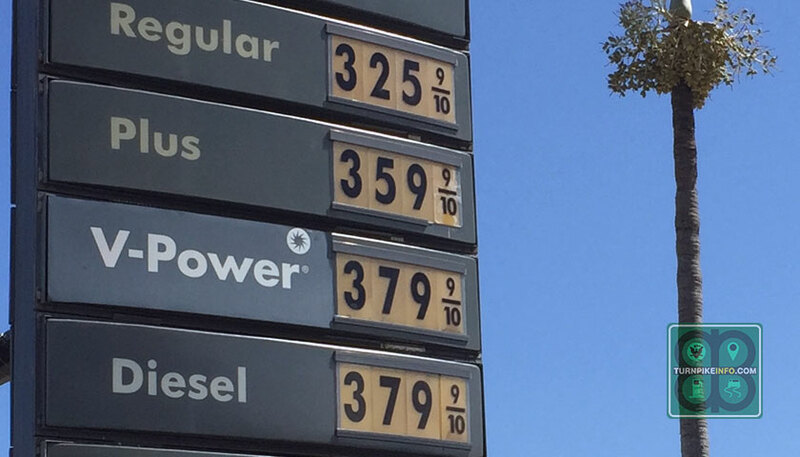 Even on the West Coast, where prices were regularly north of the $4.00 mark during summer, the price of a gallon of gas has finally fallen below $3.50. 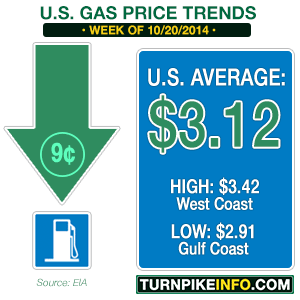 In fact, the West Coast average gas price plunged over 11¢ during the past week to settle at $3.42. Part of the reason for the dramatic drop in gas prices has been the market response to driver demand and the glut of oil in the United States. Shale oil production pushed U.S. domestic crude prices ever lower, even as demand around the world began to fall on a slowing economy. Then the end of the summer driving season hit, sending crude prices down to trade under $80 per barrel. While prices have rebounded this week, West Texas Intermediate, the domestic crude benchmark, is trading between $83 and $84 per barrel. That is down over $20 per barrel from WTI’s early-summer high. Prices began declining in the last days of June, but the plummet only happened in the past three weeks. Meanwhile, the benefit for drivers has been most noticeable. Even drivers in the Midwestern United States, where price volatility plagued the summer driving season, prices have continued to fall at an ever-increasing pace. However, Ohio still suffers under the lash of retail price swings, as evidenced by a 6¢ per gallon price increase in the past week. Nonetheless, most drivers across the midwest are paying an average of only $3.03 per gallon. In Minnesota, however, the average price for all formulations of regular unleaded gas are down to $2.95 per gallon. While gas prices continue to decline in nearly all areas of the United States, city drivers are finding that retail prices remain higher in the city than in rural areas and at gas stations along turnpikes and interstate highways. Part of the reason is the lack of real estate for competition stations in inner city areas, but the pricing disparity can often be quite dramatic, almost as if to make a demonstration of market influences of supply and demand. What is more, the pricing differential does not appear confined to a single region. For instance, during the peak summer driving season, when prices were at their highest, the cost of unleaded in inner-city Chicago was $4.28 per gallon at a BP station inside the loop, on Congress Avenue. However, just outside the city, at the Hinsdale Service Plaza on the Tri-State Tollway, the price of gas was only $3.97. In Florida, where tourist travel brings out-of-state drivers in high volume during summer and winter, the price differential between inner-city and suburban areas is equally dramatic. Prices in Oakland Park, Florida, adjacent to Fort Lauderdale, were only $3.25 on October 12. Four days later, in nearby Fort Lauderdale, spotters for TurnpikeInfo.com found prices were still $3.49 per gallon. According to the E.I.A., Florida’s average gas price on October 20 was calculated at $3.09 per gallon. 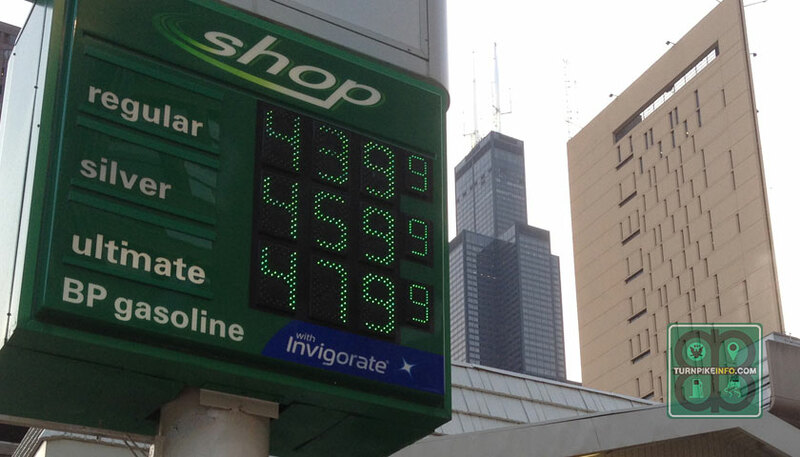 July 1, 2014: Gas prices inside The Loop in Chicago. Prices at this station on Congress Avenue were 32¢ higher than some areas of suburban Chicago. July 4, 2014: Gas prices at the Hinsdale Service Plaza of the Tri-State Tollway, just outside Chicago. Prices at this station were 32¢ less than nearby, inner-city Chicago stations. October 12, 2014: Gas prices at this Oakland Park, Florida station were 24¢ cheaper than inner city stations only a few miles away. 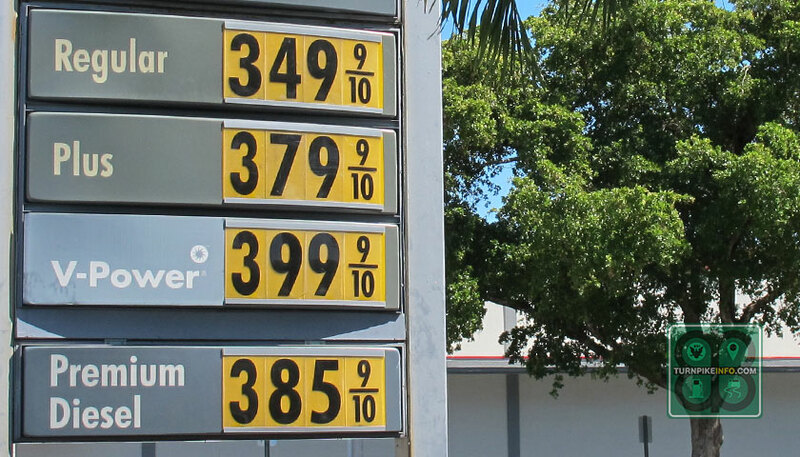 October 16, 2014: Gas prices in Fort Lauderdale, on busy Sunrise Boulevard, which connects to Florida’s Turnpike. Prices at this Shell station were 24¢ higher than another Shell station only three miles away, in Oakland Park. Meanwhile, the suburban and rural gas pricing is likely an issue that favors the nation’s truckers, who are usually between cities on long hauls. The E.I.A. survey shows the price of diesel fuel declined 4¢ per gallon during the past week to $3.66, although prices remain close to the $4.00 mark across the West Coast, particularly California.